Thursday 2nd – meet at Fernkloof lower parking area at 08:30 to consolidate transport to Platbos Indigenous Forest where we will have a leisurely walk. R30 entrance for pensioners (R50 for the young ones). There is a very reasonably priced indigenous tree nursery. www.platbos.co.za Bring along drinks and snacks to enjoy afterwards. Wednesday 15th – Monthly evening meeting at 19:00 at Fernkloof: “Zambia and the Shoebill” presented by Mike Graham. Mike is an excellent photographer who travels extensively. This promises to be a most interesting evening. Thursday 23rd – Full day outing to Strandfontein Settling Ponds and if time allows, Rondevlei and Philippi Wetlands. Meet at Onrus Trading Post at 08:00 to consolidate transport. Pack a picnic basket. Sunday 22nd July, 20 Hermanus Bird Club members proved beyond any reasonable doubt that we are Real Birders and not Sissies when we set off in freezing cold and wet conditions to participate in our annual MMBBD. The object of the day was to introduce new members to the birds of the Overberg and the rules of the game required that from 08:00-14:00 teams of 3 or 4 members identify as many species as possible in a circle (25kms in radius) with Hermanus as the centre point. Despite the bitterly cold conditions our combined total came to a respectable 132 species. The day ended with a convivial braai with lots of stories of best birds and funny moments being shared. Well done and thank you to all of you! It’s our annual QUIZ at 19:00 on Wednesday 18th!!!! Come join in the fun and enjoy some delicious soup and sherry. You might even win a prize. Another important date: Sunday 22nd July – Mini-Mini-Birding-Big-Day. More fun but no prizes or sherry this time!! 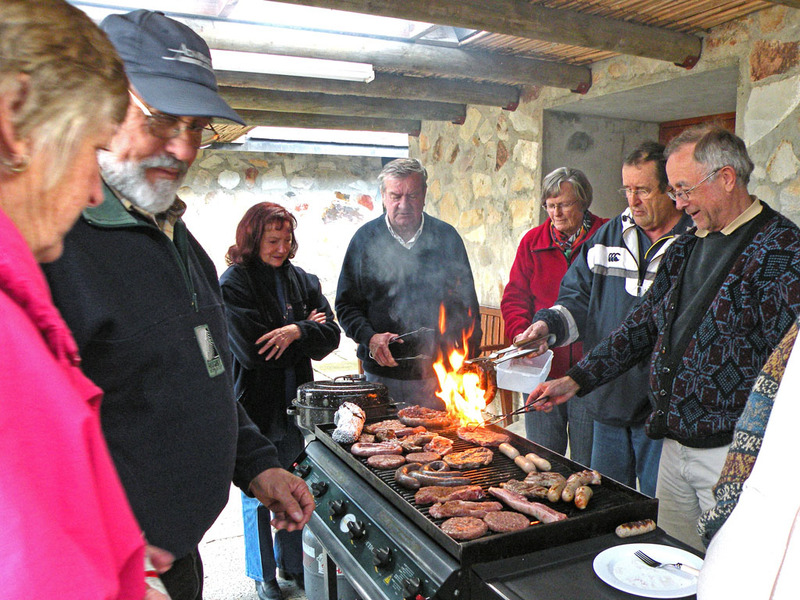 Weather permitting we are planning a great day’s birding followed by a BYO braai. Contact Barbara on 083 659 3303 ASAP so as not to miss out. A group of Botanical Society ladies who were picking flowers for display in the Specimen Hut this morning were robbed of their rucksacks and personal belongings by two men. Thankfully they were not injured, apart from some bruising, but are angry, frustrated and traumatized by the incident. Three of the ladies are members of Hermanus Bird Club and we wish them a speedy recovery. PLEASE do not walk alone in the reserve and even if you are in a group, be aware of your surroundings at all times. 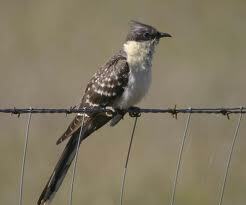 There’s excitement in the birding world again as a Great Spotted Cuckoo has been identified near Klipheuwel. On ticking this bird, avid birder John Graham became the first person to ever crack the 500 species mark in the Western Cape. Congratulations from Hermanus Bird Club! If you are coming from Cape Town your best bet is to take the N7 towards Malmesbury. Go past the Melkbos R27 turnoff, past the Engen Garage on the left and turn right toPhiladelphia. Go past Philadelphia and stay on this road till it reaches a “T” junction which is theDurbanville/Klipheuwel Road. Turn left to Klipheuwel and go over the railway line and as you come down the bridge you will turn right on a tar road. Follow that road around the bend until you come to a large Port Jackson thicket on your right. You will cross a small stream. We saw the bird on the ground in the open field on the left catching caterpillars. All you saw was a whitish bird in the short grass. After feeding for some time it flew into a 1m high round shrub where it was sitting when I left. Coming from Durbanville, take the Wellington Rd to Klipheuwel and pick up the tar road to the right after the railway line bridge. Remember there are road works so expect delays if you are in a hurry and needing to get back to work!!!!!!!!!!!!!! The latest edition of The Oystercatcher has been uploaded. Enjoy the read!